Platinum is no doubt one of the most dynamic, versatile, and enthusiastic bands in the south! This group consists of some of the most talented performers from the Atlanta area who have come together to form this high-energy, interactive experience for Weddings, Corporate Events, Bar/Bat Mitzvahs, or any other special event that requires great entertainment. From an intimate get together for fifty to an earth-shaken' party for thousands, Platinum entertains from the first song to the very last. This is a band with fresh energy, yet it has the experience and professionalism to make your event smooth, memorable, and most importantly... FUN FOR EVERYONE! With a talented rhythm section of bass, guitar, drums, keys and sax, they're able to set the vibe for three powerful vocalists who explode with dynamic energy and tight choreography. Platinum puts on a show that is the best of the best. They provide an eclectic array of musical styles, from classy Jazz Standards to party starting Motown, Disco, & Funk to the heart-stopping dance grooves of the 80's, 90's, and Today. This band is guaranteed to keep your dance floor packed! Platinum can also extend the excitement of any theme party through the use of costumes, props, or special musical requests. 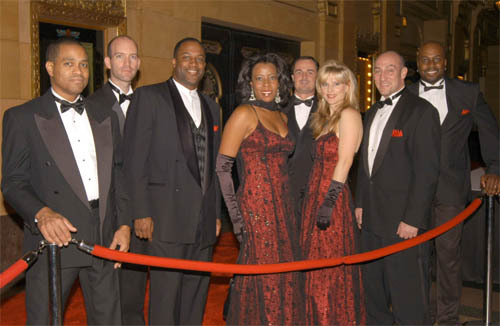 If you're looking for a band that your guests will be raving about for years... you need Platinum! If your band isn’t booked every week (and then some) it certainly should be- you are terrific! -Rita T.
The band was awesome! Beyond expectations. I appreciate everything and look forward to thanking you in person. -Lynda P.
Justin Timberlake – I Can’t Stop The Feeling! Otis Day And The Nights – Shout!